A visit to Montebello takes you into the creative heart of Cape Town, all right, one of the creative hearts. The setting alone is wonderful – umbrella pines tower over this cove of busy people, making things that fascinate. It is worth the trip for any local or for international tourists. You’ll find this on the website: Montebello Design Centre is located in Newlands, Cape Town, and is the result of a financial and property bequest by Cecil Michaelis. The Project is situated in the farm buildings of the historic site of Montebello. These buildings and land have a colourful history, being the birth place of Ohlssons Brewery and Continental China. Today, Montebello Design Centre is home to a broad spectrum of designers and artists, from jewellers to painters, film makers to landscapers. There is much to see and some tasty edibles at two restaurants. I was particularly interested in the wood carvings and in the metal work coming from The Forge. I share some of my impressions. A place of great reward. And: I had the tastiest meal in the deli restaurant with an array of interesting goodies to eat. I come from a country where snow is a rare commodity, thus the snowfall in Daeso where I was living was magical. Daeso is a small town (its name even means that!) south of Eumseung, the city where BanKi-moon, UN Secretary-General, was born. That morning early I hurried through the snow-laden streets, photographing everything I saw. I share some images here. This is the monument to those from Daeso who died in the Civil War (1950-1953). Below the tall black monolith there is a relief of heroic figures. On top of the apartment building in the background there are sirens which may be used in the event of an attack from North Korea. A formal peace between the two countries was never brokered. They are still in a state of ceasefire. This figure of Yi Sung-sin you see in a number of places. He is the great historic admiral who is credited with inventing, in the East, the modern battleship. In the early 1590s a handful of such battleships routed the entire Japanese navy and delivered Korea from yet another invasion of the peninsula by the Japanese. On that snow-filled morning he presided over a playground of frolicking children, a generation that has not known war. I found it fascinating that the Lion is a figure you find all over Korea, the “intrepid spirit”, a schoolboy explained to me with the help of a computer dictionary. Here this African icon is covered with snow as it keeps guard over the primary school children throwing snowballs, close to Yi Sung-sin. This kind of shelter, decorative and slight, you see all over the East. The Koreans, if I understand correctly, call it a jonya. It struck me the more with its snow cap. I couldn’t stop staring at this tree, feeling somehow that I was hallucinating. Whenever I go to Seoul, I have a ten-minute test: within that short time something remarkable will happen. When I came to the bus stop at Daeso this morning – even before I got to Seoul – I met a man from Mongolia. The moment he told me where he was from, I sought the physical differences from Korean people. (Is this a South African legacy?) To add odd to odd, he started speaking German to me… do all Westerners look the same? I stumbled through the conversation. He had spent four years in the DDR (East Germany). Five minutes after my alighting from the metro at Myong-dong, north Seoul, a downtown area in Seoul, I’m told, the second remarkable thing happened. At my elbow there suddenly was a dapper lady, loading me with questions – Was I lost? What had I come to see? Could she help? I replied that I had come to see the Catholic Cathedral and she said, Come, I’m off to mass. But we were early and stopped at a bistro for coffee. Yi Jae-sun or Elizabeth was 70 years old. She and her family had, with the first attacks in 1950, fled from North Korea. Her father had a teacher’s post in Chung-Tjê-ông, a small town outside Seoul. Here they spent the war – the emergency evacuations, hiding amongst the rocks of the mountain, sleeping in the dust, while they witnessed bombs raining on Seoul. Her own immediate family survived, but her mother lost her two brothers, together with five million other civilians, the highest count in a civil war in the 20th-century. We couldn’t find the remaining brother, she told me. The dust of the decades had covered her feelings. How do you feel about North Korea now? I asked. Kim Jong-ihl is their god, she said. Integration between the two countries will not happen in our time. 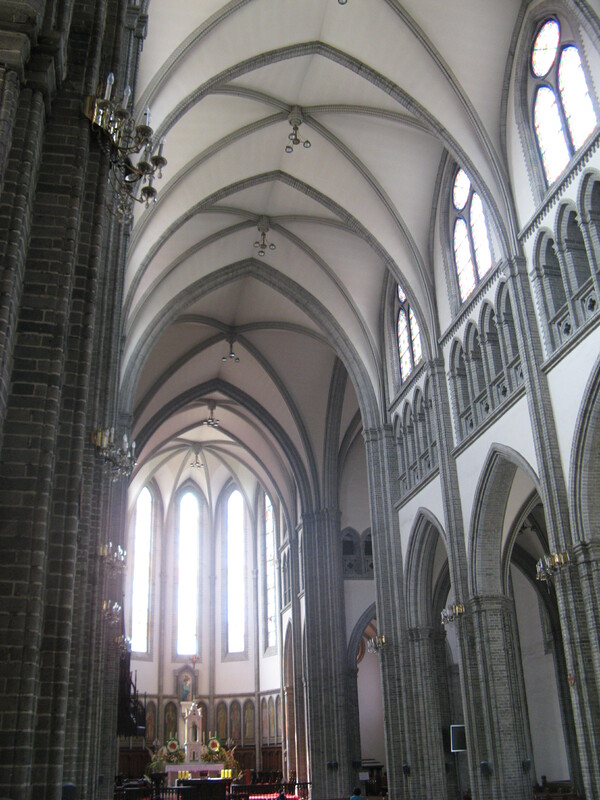 I stood in the nave of the Cathedral, an impressive neo-gothic revival with high flowering ribbing. 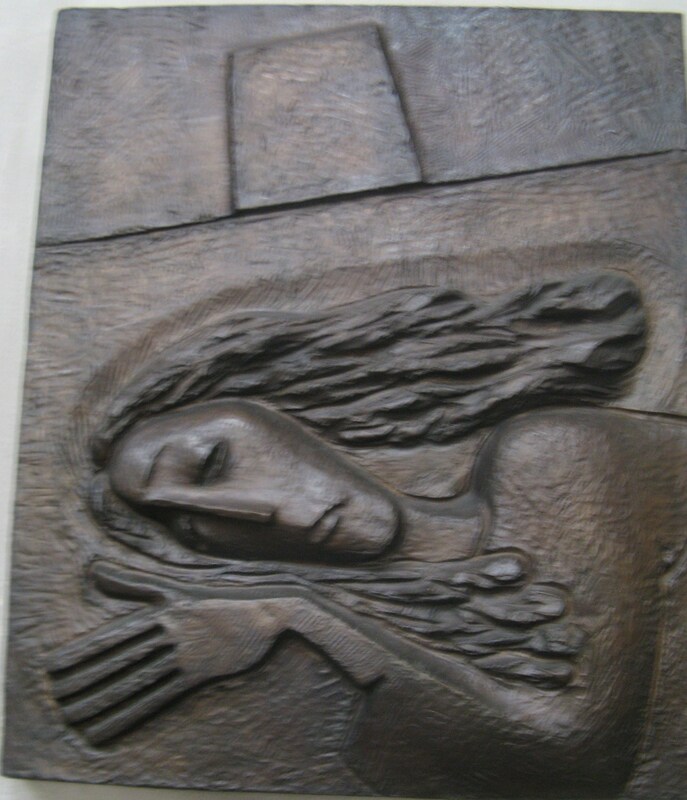 What I found moving was the depictions of the Stations of the Cross – contemporary reliefs in deep brown terracotta, recalling the romanesque I had seen in Europe,, especially at Hildesheim in Germany. Outside, in front of the church on a spacious square, there was a wedding with women in traditional hanbok – full-length bell dresses, colourful and festive. 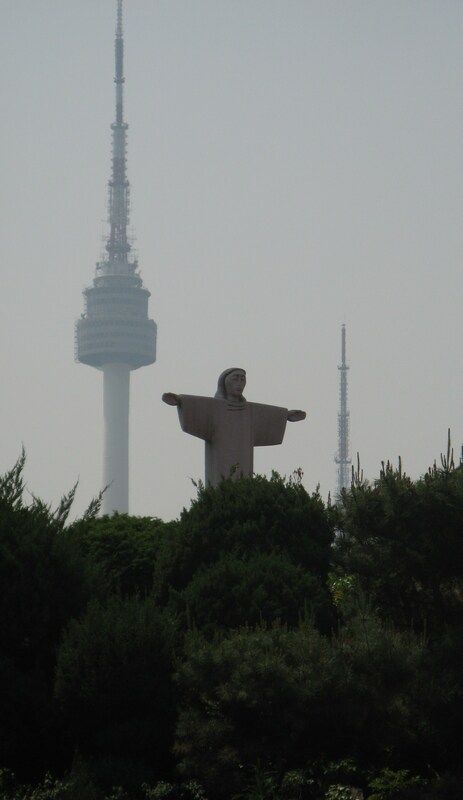 Above them against the backdrop of the modern city, stood a Christ-the-Redeemer figure, bold and stark. Along the side of the Cathedral there was a bust of Kim Tae-gon, the martyr of the persecutions of the 1840s. His Western name is Father Andrew and in the Cathedral itself there is a shrine with him wearing a tall wide-brimmed hat. More persecutions followed in the 1860s, but the Church grew along with other denominations, notably the Presbyterians. Father Andrew was canonized in 1984. I didn’t see Elizabeth again and spent the rest of the day wandering the streets, amazed by the architecture, most of which has risen in the last forty years from the ashes of the war that ended in 1953. In the ramble I found myself at the Presbyterian Cathedral, less impressive, but with its own story of martyrdom. This time it was in living memory. During the Civil War, Seoul changed hands four times, starting with the communists in 1950. When these forces were driven back, all the way from the south of the Korean peninsula, it was difficult to rout all the pockets of resistance. At this particular cathedral, which had been occupied, the church authorities assumed that the struggle was over and that they could resume services. 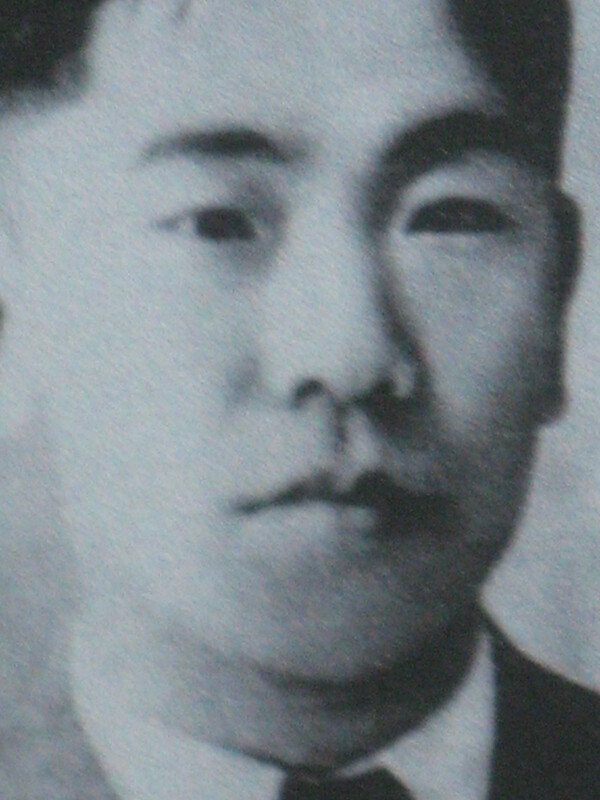 One of the officials, Kim-Eung-nak, entered the church and was confronted by soldiers. The plaque at the entrance of the church recalls his words to them, “He calmly said, I am an elder in this church.” They tortured him and they shot him. We have a grainy photograph of his face – the tentative, reticent eyes. The story stays with me. At lunch-time I munched my way through another pu-chim-ghê, the Korean vegetable pancake, watching with increasing fascination how a young cook was displaying his skills at kneading long ropes of thick white dough, tossing them through the air, smashing them down, whipping them, rolling them – working his magic like a man from a circus.